The Dude family started the day by donning our Sunday best and heading out to a piano recital. Awesome. In a recent post, I mentioned that I regret not learning to play music earlier in life. Luckily, The Princess will not shoulder this same regret. She has been jamming on the piano for almost a year now. And today was the day she got to show off. 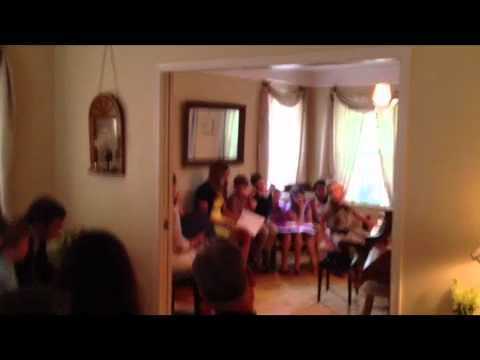 We huddled in the living room of the piano instructor surrounded by about 30 proud parents and relatives. And we watched a small group of kiddos perform strokes on the piano that I assume the majority of us have no clue how to play. Very impressive. It’s awesome to see people learning new skills and having enough confidence in their growing abilities to perform in front of others. Very cool. The Princess tickled the ivory to perfection. And she showed a lot of confidence in herself. Nothing better for a parent to see. And Little Dude? Well, he managed. He managed to remain relatively quiet, and somewhat still until The Princess completed her performance. Then we broke for the exits. I have a feeling this will be a habit at most formal engagements with the Little Dude. Here’s a quick video of The Princess tickling the ivory…and Little Dude coping with his first recital. This entry was posted in Little Dude, Princess and tagged Little Dude, piano, Princess. recital. Bookmark the permalink.